Vojtech Blau is pleased to announce its participation in the 2011 Art & Antique Dealers League Spring Show at the Park Avenue Armory. 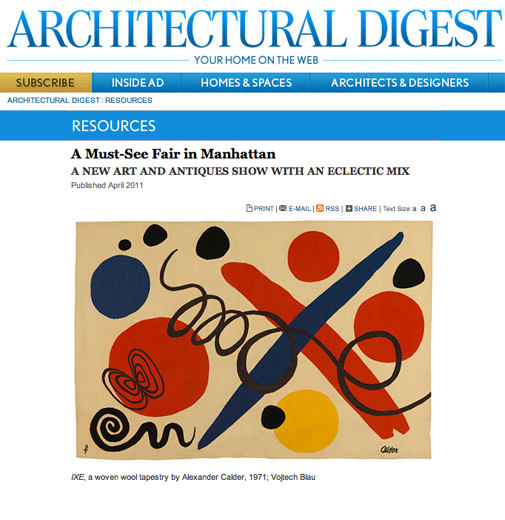 Please join us at the Armory where we will have a selection of our finest antique and modern tapestries on display, including Alexander Calder’s, “IXE”, recently featured as a “must see” in Architectural Digest. The Spring Show is open from April 28 – May 2, 2011 and is located at the Park Avenue Armory at Park Ave. and 67th st.
For a preview, visit us on their website, or read the spotlight on the Alexander Calder, “IXE”.